The remnants of Hurricane Nate cleared the area overnight. In the process, the counter clockwise rotation of the weather system has pulled down some delightlfully cool air from Canada. With a sky filled with deep blue and big puffy clouds, it finally looks and feels like fall in Killington. Color on the mountain, in the Killington basin area, and at the inn has popped. The short lived phenomenon of peak fall color is all around those of us who live and work in Killington. For the next few days we will be soaking it all in, as we continue our preparations for the winter season to come. 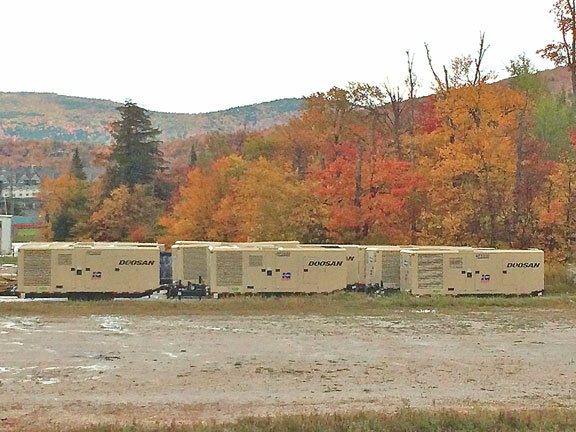 Air compressors lined up in the Vale parking lot at Killington over the weekend waiting to be deployed. Speaking of winter, planning and preparation for the change of season is in full swing. A fleet of air compressors were sitting in the Vale parking lot over the weekend. When I went up to the mountain this noon time to take todays blog picture, the compressors were moved; presumably deployed to the compressor farm in the woods on skiers left off of the Snowshed ski trail. Snow making at the resort is imminent. There have been reports coming from people at the resort that various tests of the system have been taking place for the last few weeks. Everything seems set with the start of snow making only waiting on Mother Nature to envelop the resort in cold air. And with the Audi FIS Womens World Cup returning to Killington over Thanksgiving Weekend, snow making at Killington can not begin too soon. The next couple of weeks will highlight the changing seasons in Vermont. Beautiful color will be in abundance around Killington for a few more days before shifting to the south and west of the area. After that, yours truly and many others in Killington will begin our various incantations to encourage Mother Nature to blanket Killington in snow. Wherever you may be, enjoy the fall foliage, and don't forget the leaf rule if you happen to be chasing the little white ball around in your pursuit of happiness.